Enterprise Grange Art Fest features works made of wood, clay, paint and stained glass, made by artists in school and in retirement. RICHMOND — Sometimes it can take Gus Frank years to figure out how to whittle a chunk of wood into the piece of art he’s shooting for, and he’ll have a stack of broken failed efforts at his feet before he completes a complicated piece such as a pair of scissors, carved from a single piece of wood with a joint carved into them that allows them to move just like a real pair of scissors. 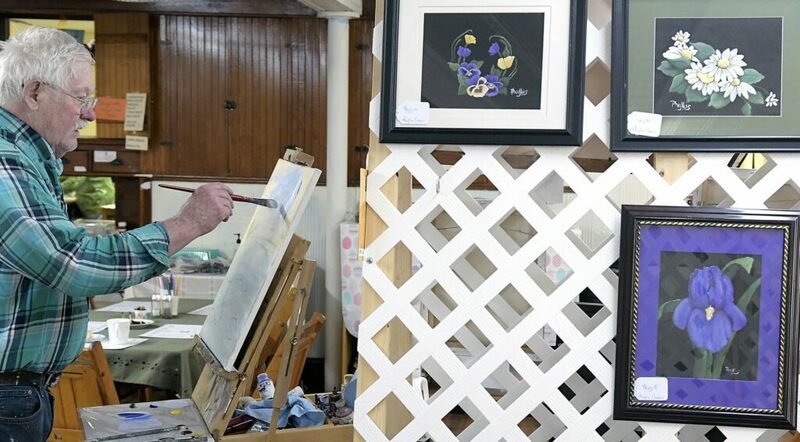 But Frank, one of several artists with their works on display, and for sale, over the weekend at Enterprise Grange in Richmond at the grange’s annual “Art Fest – Art by the Kennebec” event, doesn’t seem to mind. He said the first thing he carved was a ball inside a box. It took him five days, and before he completed a single piece, he had a tall stack of broken ones to show for his efforts. He said now such a piece would take him about three hours. He said he got into carving as a way to spend his time after he quit drinking. The pair of scissors, with moving parts, took him about three years to figure out, he said. Even now, he said he breaks a couple of pieces of the Maine basswood he usually carves with before he completes an unbroken scissor carving. Like Frank, artist Julie Moulton, of Harpswell, looks at the time she puts into her artwork as time well spent. Her display area at the grange was a mix of books with their pages carved and folded into works of art and soft, fuzzy stuffed animals and other items she made by needle felting. Other books she cut and folded into art included a version of the Superman logo with “mom” cut into it, and a heart outlined by a second, larger heart. Moulton, who operates as Maineiac Crafts, said she likes smaller art events like the one at the grange because they provide a chance to get to know the other artists and their work. Marilyn Stinson, community service coordinator for Enterprise Grange 48 in Richmond, said the Art Fest started about 20 years ago, as part of Art in Schools month. 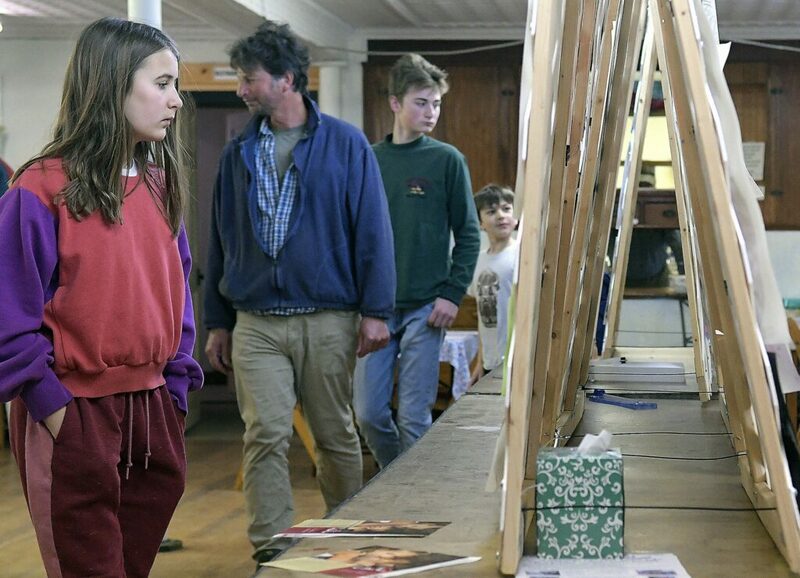 One year, when much of the art of local students had already been displayed elsewhere in town, adults were invited to join, as they have been since. Student artwork remains a prominent part of Art Fest, however, with art from local students filling several display boards, which were on loan from the state grange organization, including paintings, drawings, collages and photographs. Stinson said there are a lot of talented artists in the area, many of them right in Richmond. Richmond resident Mary Louise Dailey, who studied at the Ivy School of Professional Art in Pittsburgh and previously worked as a commercial artist for McGraw Hill, said she left that behind to do her own thing in Richmond. She works in a variety of mediums — making elaborate stained glass jewelry and jewelry boxes, hand-painted animals such as seals and lobsters — and has won international awards for her stained glass work, including for a piece she now has lighted in her home featuring the Rockland breakwater. Her decorative mini-lobster figurines are made from a mold and, like her other designs, are hand painted so each is one of a kind. They are shaped by a mold, which she made herself. Her model for the mold? A live lobster, which when she was done using it as her model, she cooked and ate. Also featured were the paintings of Richmond resident Ernie DeRaps, including multiple Maine lighthouses. DeRaps, who started painting about a decade ago when he was 80-years-old, and his family previously lived as lighthouse keepers at four different Maine lighthouses, over seven years, ending in 1962. At his booth Sunday afternoon, he painted from memory an oceanfront scene he said was probably from Monhegan, one of the places where he was a lighthouse keeper. A wide variety of paintings were also displayed by Jim Decker, an artist with a small gallery in Richmond, who, like DeRaps, painted during the event. A bake sale and lunch sales at the weekend-long, otherwise free event raised funds for improvements to access the building for people with disabilities.